Blakistone Island Light was once located on Blackston Island. Today the island is better known as St. Clement's Island. The island is only 5 miles downriver from Cobb Point Bar light. Congress appropriated $3,500 in 1848 for the lighthouse construction. John Donahoo was awarded the contract at a cost of $4,535. The structure was a two story brick dwelling, with a light tower rising from the ground through the center of the building, and sat on a two acre point of land at the southern tip of the island. Construction was completed in December of 1851. In 1919 the U.S. Navy purchased the island. The lighthouse was automated and decommissioned in 1932. On July 16, 1956 it caught fire. Although the cause of the fire was undetermined, many believed that it was the result of a stray artillery round fired from the Navy's weapons range at Dahlgren, Virginia. Blakistone Island Light is best known for Confederate raiders putting the light out of commission in May, 1864. However, it was quickly repaired and relit several days later. The lighthouse remained under military protection, including a patrolling gunboat, until the end of the Civil War. 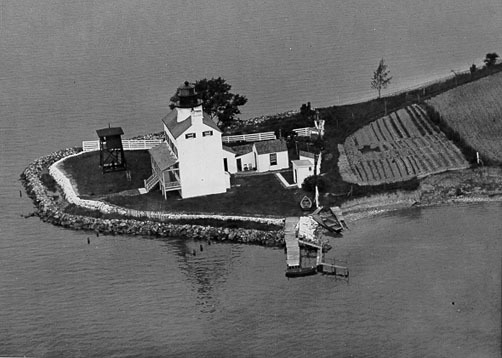 St. Clement's Hundred, a preservation group in southern Maryland, has launched a drive to build a replica lighthouse on St. Clement's Island. On Friday, April 13, 2007, work started on the lighthouse.The only thing different about the replica will be its location, about 150 yards away from the original site, which has been undermined by erosion. The estimated completion date will be around October 1, 2007, in time for the Blessing of the Fleet. From Washington, D.C.: Take 495/95 Beltway to Exit 7A (Route 5 south to Waldorf). Follow Route 5 to Waldorf, make a left in Waldorf to continue on Route 5. In Mechanicsville, Route 5 turns right. Continue on Route 5 to Morganza. Turn right on Route 242. Follow to Colton's Point. Turn left onto Bayview Road and follow Museum signs. From Virginia: Take Route 301 to Route 234 (turn at the White House Hotel). Take Route 234 south to Clements. Turn right onto Route 242 and follow to Colton's Point. Turn left onto Bayview Road and follow Museum signs.